Muscular injuries occur because of rupture of individual muscle fibres. It is accepted that this can be a progressive process, where small numbers of fibres are injured and gradually contribute to a significant restriction of movement. It can also occur more dramatically, when a greater number of fibres rupture in response to a single demand. Typical of this would be where a horse slips, falls, or has to correct vigorously to save itself from going down. The first of these commonly occurs in the pelvic area, where the large muscle masses that control explosive movement come under constant work demands. 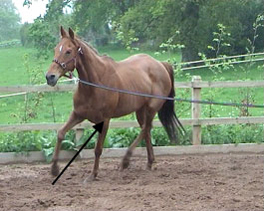 However, the consequence is altered stride length, compensation by other limbs and muscles; a spiral of lameness that progressively affects more general movement. It is important to recognise that, while equine muscular injury closely follows the nature of that in human athletes, anatomical features mean manual massage and stretching exercises are limited in their ability to influence repair. Treatment has two basic aims: 1 to heal damaged tissues, involving the breakdown of scar tissue and adhesions; 2 to restore full functional movement in the damaged muscle or muscles. To achieve repair, especially in deep tissues, as in the quarters, muscle contraction has to be restored and blood supply stimulated. Therefore muscle stimulation is promoted electrically, appreciating the depth of lesions and reaching more than superficial tissues. Secondly, blood flow is encouraged by the use of equipment, like ultrasound or laser, that can effectively achieve this. The return to full normal movement requires physical exercise, which is effectively done on a lunge. 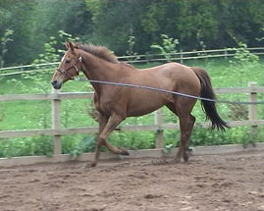 Many affected horses should not be ridden until symmetry of movement has been restored; although some horses may not, for one reason or another – like joint lameness – be capable of being lunged. In such cases, an informed decision would have to be made by the person responsible for treatment. 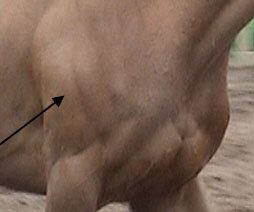 We need to understand that routine muscle care is vital for all athletic animals. In the past, this was achieved by daily strapping of all major muscle groups. It helped to disperse waste products of normal contraction as well as effusions from damaged areas. For those of us who treated muscular problems in the Sixties and Seventies, there seemed to be a lower incidence to contend with. Now, perhaps because we are not encouraged to strap, or to recognise problems in the muscular system, the incidence is far greater. This, too, may reflect more intensive training regimes, the use of all-weather surfaces, the tendency to use steep gradients as a means of extra work-loading. Ideally, strapping will take five to ten minutes per day on each limb. The quarters and shoulders are massaged, using a wisp or other suitable implement, like a pad. The movement can be an extension of normal grooming, as when using a brush firmly; or firmer, bringing pressure down on deeper areas by gentle pounding; or manual, using fingers and palms to encourage suppleness. Many won’t have time to strap, this being the reason the exercise became obsolete in the first place. 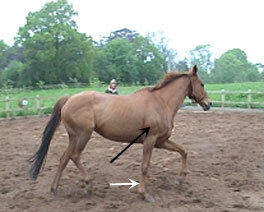 However, any effort to soften the heavier muscles of the shoulder and pelvic roof have to be an advantage to the horse and reduce the incidence of lameness coming from this source. The triceps muscle on the left leg above is normal as it bears weight. The right-hand triceps muscle is swollen; it isn’t coincidence that the tendon on this side has broken down. The close-up of the muscle in use (right) shows the degree of swelling quite distinctly.